The story is about Viraj and his younger brother Nirvan who is a college student. Viraj gets a unexpected call from Nirvan in the middle of night which makes him worried. He didn’t have a cordial relationship with him but nevertheless has care. He discovers that actually Nirvan has gone missing and the last call from him was suggesting the same. Viraj starts to unravel the mystery of his missing brother and how such thing happened with him. On the trail to find Nirvan, Viraj gets to know of some revelations that Nirvan had a breakup with his girlfriend and haven’t met her since then. Additionally, a lady Mahi had an extra marital affair with Nirvan. But the story doesn’t stop there, since Viraj starts to think that all the people he met that has connection with Nirvan are involved in his disappearance. He has doubts on them and gets frustrated. The last work spoken by Nirvan was Mahi. Later, Viraj get some new lead and comes to a flat with his friend and start looking for Nirvan there. Before Nirvan went missing, there are angles of love, heartbreak, extra-marital affair and possible betrayal from his close people. Which one holds true in his disappearance ? Will Viraj succeed in solving the mystery of his missing brother ? Stay tuned to Gumrah this Sunday @ 7 PM on Channel V India. – Recent work in role of Varsha in Zing TV’s PTKK Episode 18 aired on 27th March 2015. 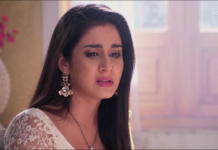 – Follow the tag Prerna Wanvari actress to read articles written on episodes where she had worked. – Twitter and Facebook page of Prerna.